I shocked myself on Friday night by watching some of the Royal Wedding on the television. It was the end of a difficult day. I was weak and vulnerable. I had ridden through the rain to meet D and the cat at the vet’s and then not changed out of my wet clothes before I had taken a teeth-chattering chill. D grew up under the benevolent eye of Chairman Mao and certain ingrained principles against feudalism run deep. His curiosity was limited to the fashion aspects: he thinks fascinators like Julia Gillard’s are a bit rude to your neighbour on the fascinated side. After a little bit of the arrival of guests and later the bride and an overview of the outfits sported, he would have no more of it. My interest was musical and marginally ecclesiastical. The royals themselves, as opposed to the splendour they could command, were perhaps the least of it. My interest didn’t extend to watching the whole thing, just to keeping an eye on when the better musical moments might be. I missed the beginning, so I missed Parry’s I was glad. I squirmed (as did the happy pair – well, they certainly fidgeted a bit) through a chunk of sermon. The archbishop was extolling the soul-enhancing qualities of marital love as the epitome of selfless love for another as a result of a solemn commitment undertaken – I take this to be an updating of the guff at the front of the BCP which says that one purpose of marriage is to enable us to understand the mystical union of Christ and the church. He seemed to be stressing the importance of the formal commitment as almost a practical necessity – as if sticking together in mutual unselfishness cannot be done unless there is such a solemn pact. I wonder if, after I went back to whatever I was doing otherwise, he went on to explain why only heterosexual Christians should be vouched such instructive sacramental good fortune. As I watched the dean officiate and the director of music direct, I recalled that Westminster Abbey is a Royal Peculiar. That is relevant to how Lord Jauncey of Tulichettle was appointed to determine whether Martin Neary, who was responsible for the music at Diana’s funeral (which I rather think of as the last episode in this particular ecclesio-royal saga) had been (in lay terms) unjustly dismissed as organist of Westminster Abbey shortly afterwards. The cause for this dismissal was that Neary and his wife had set up what in essence was a labour hire company which purported to engage the adult members of the choir as freelancers for the outside-Abbey commitments such as tours, recordings and the like. This was an arrangement of benefit to the singers and the abbey alike, but apparently not quite Kosher from the point of view of the deductions (including national insurance contributions) which should have been made had the singers been directly employed by the Abbey as usual. When HMI (the revenue) started sniffing around, the powers-that-be summarily hung Dr Neary out to dry. They discovered (or said they discovered) that without telling them the Neary’s had also been accepting engagements on behalf of the choristers – necessary if the whole choir was to be engaged, you might think, and that the Neary’s had in effect been paying themselves (relatively modest) management fees for this extra work. This, the Abbey said, was a secret commission. That’s a sackable offence, and the sort of thing you can be sacked for pretty well summarily. You have to wonder if there were other antagonisms at work between the dean and chapter and the Nearys, and whether, but for those antagonisms (or the desire to wash their hands of the dodgy tax and national insurance aspects), the Abbey could and would have stuck by him. Instead he was sacked. The Nearys appealed to the Queen as visitor Lord Jauncey was appointed to advise the Queen in her her. He said the dismissal was OK.
For some three and a half years Dr and Mrs Neary ran a business whose principal income earning assets were the lay vicars and the choristers. They derived profits from this business in the shape of fixing fees and surpluses on events involving the choir. They did not tell anybody in the Abbey what they were doing. They disclosed to no-one there that they and not the Abbey authorities were entering into some contracts on behalf of the choir. The fact that the Abbey authorities had all the information which would have enabled them to find out about the contracts, had they been so minded, does not alter the position. Dr Neary sought an increase in salary for Mrs Neary without mentioning that she was already receiving substantial sums by way of fixing fees. [… -one other example]. By these activities and their silence during this long period they were in clear breach of their duty of fidelity to the Abbey. They used their position as Organist and Music Department Secretary to make secret profits over a prolonged period and they entirely failed to inform the Abbey authorities of what they were doing, notwithstanding the fact that there were ample opportunities so to do and no good reason for not doing so. I consider that this conduct was such as fatally undermined the relationship of trust and confidence which should have subsisted between them and the Abbey. I am therefore satisfied that the Dean and Chapter were justified in summarily dismissing them. The nub of it is in the italicized bit and the conclusion about the undermining of the relationship of trust and confidence. If you read the rest of the decision carefully you will see that the Nearys were still hung out to dry, albeit reluctantly. That’s because, despite some wonderment at the chapter’s apparent and (to my eyes) studied incuriosity about whatever arrangements the Nearys had set up, in the end it was accepted at pretty much face value. The Nearys were sacked for not telling the chapter things which it seems they may have thought it was best for the Abbey and all concerned that the chapter not know and which the chapter certainly showed no particular desire to know. Well, that’s just a base (in the Marxian sense) reflection on the beautiful music and the people making it. I’m prepared to forgive a lot for the sake of the music. It was Parry’s big day out. Apparently Prince Charles is rather keen on Parry – it’s just the sort of Tory-Englander last-night-of-the-Proms taste that you might expect him to have and not an enthusiasm that everybody shares. 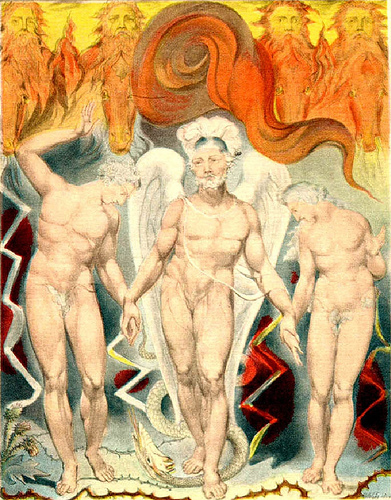 Not only did we have Jerusalem (to words by Blake, of course) but also “Blest Pair of Sirens” to words by Milton. Neither of them a notably royalist poet. As ever, it was clear that there was quite a lot of talking in the congregation while this piece was being sung. I hate that but it is pretty universal during the signing of the register and of course the music would have been much less distinctly audible to almost everyone there than it was to us on the television. I shocked myself even more when Gordon Jacobs’ arrangement of “God Save the Queen” gave me that warm inner glow that only true comfort music can create. I notice that the Queen herself, quite properly, didn’t join in singing this. I guess it is a bit like singing “Happy Birthday” on your own birthday (unless, of course, it was [unresolved subjunctive-ish mood alert] also someone else’s). After the service ended, I kept watching the procession back to Buckingham Palace for a little while. My favourite bit was when the Duke of Edinburgh launched himself up into his and the Queen’s carriage in quite an alarming way. He seemed to be having rather a torrid time once he was up manoeuvring himself within the carriage and into his place, and the BBC coverage tactfully (or so it seemed to me) switched to another shot altogether. Some of the “traditions” which were being talked up in the commentary and the presentation were based on as few as one previous iteration (eg, “the kiss” on the balcony of Buckingham Palace). The spectacle was undeniably entertaining. Maybe I shouldn’t be surprised I was so easily sucked in. It was faintly ridiculous that Julia Gillard attended. Quentin Bryce was more than sufficient representation for Australia. If I thought the wedding really had anything serious to do with Australia, I might have withstood its allure more firmly. I find it hard to imagine or credit that in 20 or 30 years (assuming Prince Charles lives to 80 or 90) we in Australia will owe our allegiance to William V.
To the spikey Christ Church St Laurence early this evening for a Milton-quatercentennial reading of excerpts from Paradise Lost devised by Beverley Sherry. Apart from the openings of books I and III, Dr Sherry’s selection eschewed the poetical apparatus and concentrated on the core of the plot: “man’s first disobedience and the fruit of that forbidden tree.” As a result, the more cosmographical sections took a back seat to Book IX. XII: 537 to end (Michael brings his preview of world history to Adam to a close and gives him some advice for the future; they descend from the top of speculation and join Eve, who’s been given some comfort in a dream; they are expelled from paradise and face the future together). NSW Premier Nathan Rees, who has said that Paradise Lost is his favourite book, read the celebrated opening invocation of the muse (I: 1 -33). Perhaps he was wary after his “being in traffic is like being in love” moment, because he wasn’t the most demonstrative of readers: the famous long-postponed initial principal verb, “Sing,” was almost missed, and enjambement is clearly not his thing. It was good of him to come. Accompanied by a minder or two or possibly a driver, he left at about line 40. The non-celebrity readers did better than Mr Rees, some better than others. Milton himself besides, the evening belonged to Dr Sherry. She joined the dots with her own synopsis of the poem, laced liberally with verbatim quotes and smaller fragments of Miltonic phrases, delivered without notes or prompts of any kind. She is clearly an enthusiast. Dr Sherry allowed herself the closing lines. I do love Miltonic endings. I’m still trying to work out what it is about them, but whatever it is, I feel this also, for example, in the endings to his Hymn on the Morning of Christ’s Nativity or Lycidas. The ending of Paradise Lost is less well known than the opening, probably because fewer readers get there, but if you have reached it even with an abridged passage through the poem as we had, it is at least as good, if not (as it should be) better. The archangel Michael has taken Adam and Eve in either hand to the eastern gate of paradise (this is on a hill), over which a flaming sword of God (possibly a comet) hovers (I’m struggling here, bear with me) at the front of a host of cherubim. That is the moment illustrated by Blake in the picture at the top of the post and used also in the program which was distributed. Then, shoved (courteously but firmly) out the gate, heading down to the plain below, they are on their own. Maybe I’ll go back now and [re]read more of the poem. In 1980, with a bunch of friends from the English department of Sydney University, I organized a reading of the complete Paradise Lost. I stayed up very late the night before breaking up the text into sections and identifying dramatis personae so that it could be read in a semi-dramatic way with a narrator and people doing the speeches. As a result, I was very very tired. I confess I didn’t stay for the whole reading, which took place in the then English Students’ Common Room in the Woolley Building, but sloped off in the afternoon for a nap at Women’s College in the room of my then girlfriend, UB. It took all day – a bit under an hour per book, as I recall. Some years later, I mentioned to Dr Bev Sherry this event and, as she is a keen Miltonian, it must have stuck in her memory. It is for this reason that I claim some authorship of the concept behind todays’s reading of exerpts (only) from the poem in honour of Milton’s Quatercentenary. Milton’s notional birthday of 9 December (possibly actually his baptismal date) is presumably under the Julian rather the Gregorian calendar. It is a moot point therefore when the anniversary should properly be celebrated, though on any view I would have thought that today was not the date. Ironically, somebody previously identified as “the evil one” in a long-defunct blog which until recently was still traceable on the net but which I can no longer track down has secured the role of God. Other persons known to me have other parts. It seems to be a family job. Apparently Nathan Rees will be taking part as well. More ironically still, the event is to take place at Christ Church St Laurence. This would definitely be too bells-n-smells for Milton, were he living at this hour and present. I shall try to get there, for old times’ sake. You are currently browsing the archives for the Milton category.